Making Moka Coffee 3 a photo by Lameen on Flickr. It’s almost 7 years from the day when we first touched down in Rome for a family holiday. Hearing that I liked coffee, my cousin’s Italian husband handed me a Bialetti moka pot and some ground Lavazza coffee, with a short explanation on how to use it. A little skeptical, I tried it on the first morning and was amazed at the taste (Yes ! back then, I only drank expensive instant coffee and/or French Press coffee). For the first few days inside our rented holiday apartment, I only had coffee in the morning, but after the 3rd day, I got used to having it at least twice a day. On departure from Rome, I thanked my cousin’s husband for introducing me to the moka pot. 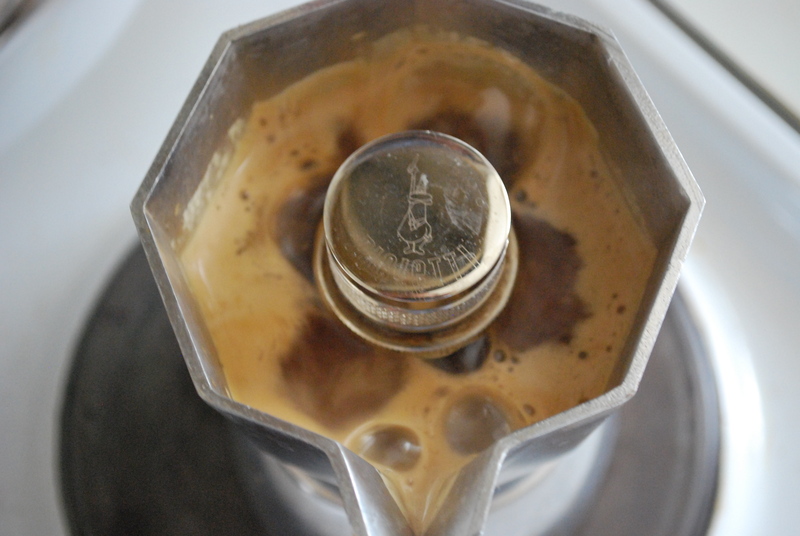 On arrival back home in Vienna, the craze began – I needed a moka pot and fast. Back then, believe it or not, even in Vienna, Austria, it wasn’t easy to find one and I was kicking myself for having not bought one in Italy before we left. I found out later that Italians never leave Italy without one and I should have followed that concept. In any case, I goggled Bialetti, found their website and was glad to see that they had an on-line sales option. BUT, alas it wasn’t that easy – being frustrated with trying to buy a moka pot on-line, I decided to call them and guess what, their English voice-mail said they were on holiday for August – how can a company go on holiday for August ? In any case, after many lunch hours spent up and down the city of Wien (Vienna in German), I eventually found a 6 cup one. Afternoons at work were not going to be the same, with colleagues popping their head into the mini-kitchen, drawn in by the smell of Italian style coffee (the aroma of making coffee on a moka pot is amazing), wondering what Lameen was doing. Those brave enough, joined me, after all it was six cup moka pot. 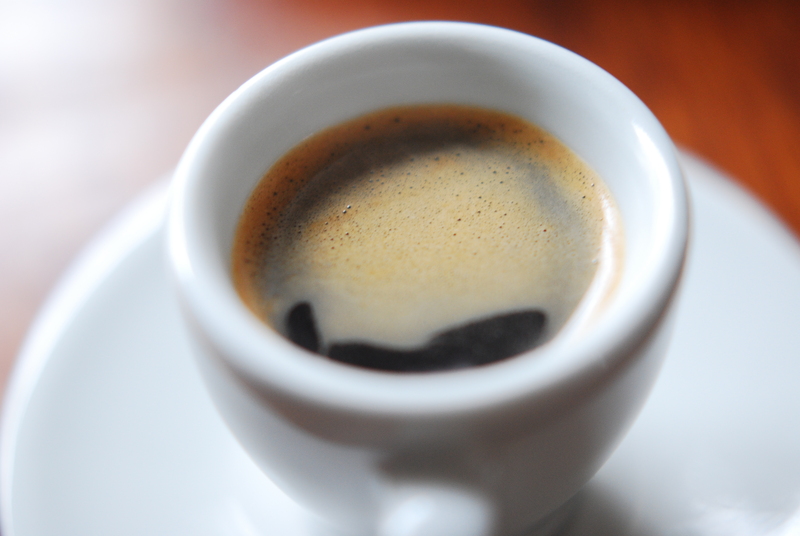 On that, six cups in Italy, really means six espresso style cups. AND that folks is the beginning of “From Coffee with Love“. I am a bit puzzled that I haven’t related this story here, because from then on, I went full-on into coffee. 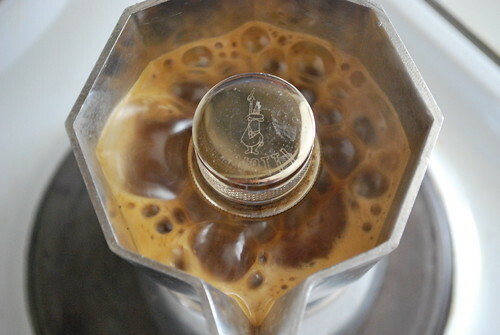 I began with a Bialetti Brikka (pictured above), which is a moka pot that produces crema and then I went on to espresso machines and now I have a caffe, Escape Caffe, as you all know. 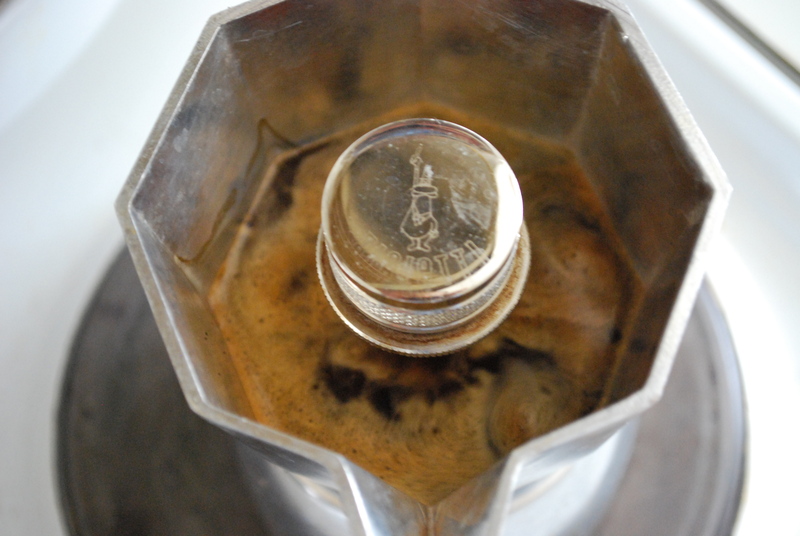 So, here’s a quick step on using a Moka Pot, my way of course. Assume you have grinder, good beans and scales (optional in this case) and of course a Moka Pot. 1. Unscrew your moka pot and pour enough cold water into the lower cavity (about 100ml for a 3 cup) until it us just below the steam release device – this is easy – there’s a hole for the outlet inside the bottom of the moka pot. 2. Place the portafilter on top of the cavity containing the water. 3. Grind your coffee on a grind coarser than espresso but not as much as for a French Press. So, for example if you have a grinder that ranges from 1 – 10 with espresso at 2 and French Press at 9/10, grind on 4. 4. Place the ground coffee into the filter holder till it fills it and lightly tamp with your fingers (see below). This is the reason why scales are not essential for this method, because you should not put too little and not too much, just enough to fill the filter. I’m guessing for a 3 cup, about 13 grammes. 5. Screw the top on gently and place onto a hob turned to full, because you want it to boil. A note, Bialetti Moka Pots are made with aluminum because it is the fastest heat conductor – i.e. it takes on more heat than any other metal that we know off so far. This means that the moka pot heats up very quickly. Nowadays, stainless steel ones are made, with a heavy price tag, but good old aluminum is best. 6. First Light – Signs that you did the right thing – a little coffee escaping. 7. 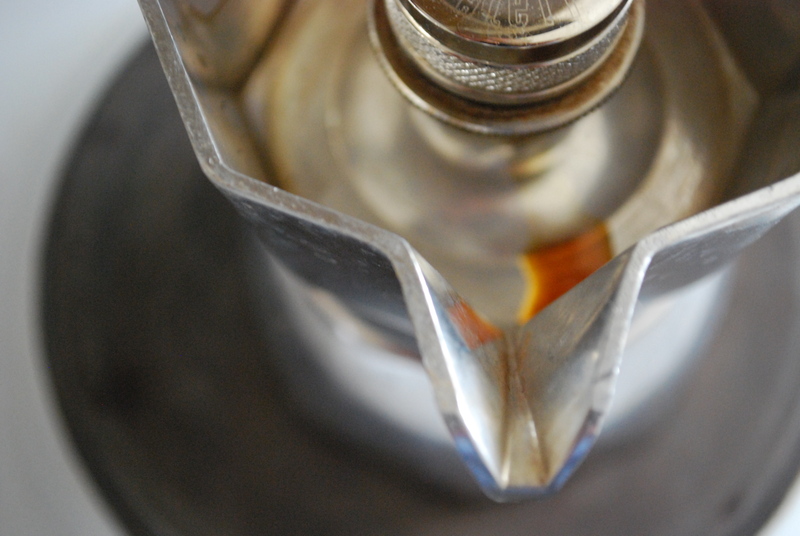 It’s coming – yes, the excessive heat and steam building up inside the bottom part of the moka pot, pushes the coffee through the sieve an into the top cavity – the wonders of a simple but effective creation. 8. Whoooshhhhh ! is what you hear and this is what you see when its finished. You can enjoy black with a little sugar ( I recommend a little for this method) or with cream, yum. Caution: Don’t place the moka pot anywhere after it has finished, except on a hot plate, as the pot is still very hot. 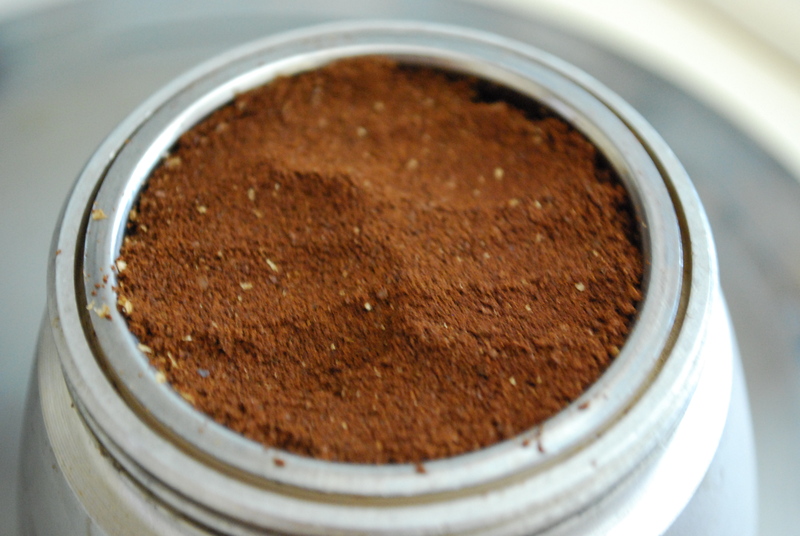 Let it cool down before you wash it by emptying the puck (used coffee) and rinsing out the base and top parts. The Moka Pot is really simple and when I introduced it to my staff at Escape Caffe, they were amazed by the taste and wanted more. We plan to start selling them soon.